« Rewind: Should MMOs be Made From Books? So, as I mentioned last night, I just purchased Star Trek Online from Direct 2 Drive. I had planned on letting the download manager run overnight but, as it turns out, I didn’t have to as the entire 8GB file downloaded in just under two hours! There were no patches to install or settings to muss around with, so I was able to jump right in to create my first character: a stylish Vulcan in a TNG-style uniform. Character creation was good, as any Cryptic fan will tell you. A friend jumped online with me today but refused to tell me his name, insisting I’d “know him when I see him.” Sure enough, a minute later an almost perfect replica of Drizzt Do’Urden was standing in front of me (sans the scimitars). There are lots of options for the creative-types to make their character look pretty much however they want, within the Star Trek IP. The tutorial impressed me. There was a lot there for even a casual Trek fan to gush over. Even if the game were to fail on every other count, it still feels like Star Trek right off that bat. That’s exciting and exactly what I was hoping for. The voice overs were mostly very good. The tutorial instructions and NPC voices were done well and added to the immersion of the environment. Ironically enough, Leonard Nimoy was probably the worst one of the bunch. I guess he left his acting days behind him because the total lack of enthusiasm on his part was disappointing. Space combat was great. I love that it’s tactical. There’s much more micromanagement than in a lot of other MMOs, since you’re always watching your shields, or propulsion, or energy levels. Positioning is important to, so you can get the most out of your ships weapon loadout (certain weapons are only on certain sides of the ship). Ground combat… didn’t disappoint me like I’d thought it would. It, again, felt very ‘Trek. It’s not fast paced. It’s not ultra flashy. But, it’s shooting with lasers and phasers, and crouching and rolling, and doing things you’d expect to see in a show. Now, I know that the tutorial is usually the most polished part of a new MMO, so maybe bugs crop up later on. But, if it’s consistent throughout, I don’t see it being as big of a problem as people make it out to be. Maybe the slowness would become frustrating, but that’s something I can’t make a judgment on without seeing how the game unfolds in later levels. Environments were wonderful. I loved flying my ship around space and seeing distant suns blooming against my camera lens. It was all artfully done, fun to look at, and a pleasant change of pace from traditional fantasy MMOs. The same applies to the ground environments. Ship interiors were… shippy. What can you expect? Now, with any reflection on a new MMO, there’s bound to be some issues. For some reason, both my friend and I would crash whenever we tried to group at different stages of the same mission. Weird. And glaring, considering how early on this happens – and to both of us, so I know it’s not just me. The game performed well, even at maximum settings (2x AA), but I did get some occasional hitching. Overall, these are fairly minor problems, as once we were out of the tutorial, we were able to group up without problem. So, let me say again, I’m impressed. Cryptic may have done things that I think were thoughtless in the past but this introduction to STO actually went very well. It, honestly, far exceeded my expectations in every single way, and that’s something. 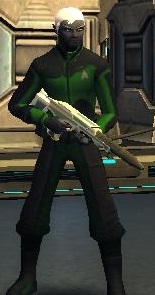 In the end, I don’t know that it will answer everything I want from an MMO– but, if it can answer everything I’d want from a Star Trek game (which is to feel “trekky,” be fun — not necessarily perfect –, and offer me a unique experience) then it’ll do all that it needs to for me. If it keeps up this way, I could even see sticking with it for a while. Sometimes it’s important to notice that, even under the firestorm of negative reviews, there are still people who find genuine fun in these games. Tipa, Kae, and more are smart and experienced players. Would they stick with it if it were as bad as people make it seem? No way. I’m not expecting STO to live up to my usual MMOs in every way. But it doesn’t need to. It needs to do what it tries to well. Hopefully, it’ll pan out that way in the weeks to come. Tutorial: One and a half thumbs up! Glad you’re having fun. I think that last half of you last paragraph is the important part. A lot of people went into the game with large expectations, and of course were disappointed. This is something that also concerns me fore when SW:TOR comes out.